Are You Trying to Give up Nicotine? Nicotine continues to be popular with teens and young adults, and there are more ways to become addicted than ever before. Cigarettes and chewing tobacco remain, while e-cigarettes and vaporizers are now available in tempting flavors. 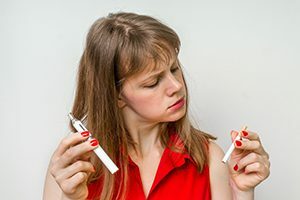 We all know about the numerous side effects tobacco and/or nicotine can have on health, so there are plenty of reasons you might want to kick the habit! Instead of quitting cold turkey, pick a target date one or two months away and slowly taper your use as that date approaches. Try reducing by 10-20% per week. When leaving the house in the mornings, bring only the minimum amount of cigarettes or nicotine needed for your daily limit. If you have trouble reducing your number of smoke breaks throughout the day, try ripping the ends off your cigarettes to make each one smaller. Cigarettes, chewing tobacco, and e-cigarettes all vary from brand to brand in the amount of nicotine they deliver. (And the same e-cigarette flavor is often available in different concentrations.) So if you’re trying to break the addictive habit, it may be useful to first research which types contain less nicotine than others (and are therefore less addictive). Then, switch to those brands and wean yourself off from there. For anyone battling a tobacco or nicotine addiction, certain activities or periods throughout the day can trigger cravings. (After a meal, during a car ride, or first thing in the morning, for instance.) Whatever your unique habits may be, identify the top 3 examples of when you like to use nicotine and work your hardest to quit during these times. You’ll find that it is just as important to break the routine of when and where you smoke as breaking the nicotine addiction itself. For many people, tobacco and nicotine use is just as much about “mouthfeel” as it is about a physical addiction. They literally miss the feeling of a cigarette, chewing tobacco, or other nicotine product in their mouth. For these individuals, a substitute of chewing gum or hard candy can help relieve some built-up stress and give their mouth a new sensation to provide distraction. There are also several chewing tobacco substitutes made from coffee or even beef jerky! Nicotine replacement therapies, such as the nicotine patch or chewing gum can ease cravings and help beat addiction. Patches are typically good for 24 hours and are worn over the course of several weeks, with the amount of nicotine delivered decreasing over time. Nicotine gum therapy works similarly, with one piece of gum being slowly chewed for 20-30 minutes every 1-2 hours. Sometimes these additional tools are all that is needed to take the edge off, so don’t be ashamed if you need the extra help; do whatever is necessary to stop an unhealthy habit!